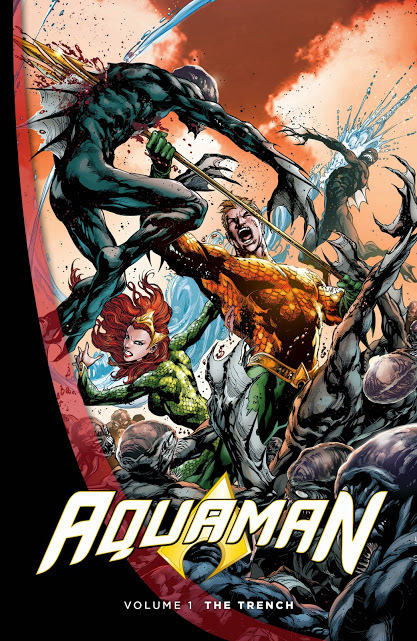 SNEAK PEEK: "Aquaman" Spins Into the "Trench"
"Aquaman" Spins Into the "Trench"
The 'Trench', applied to both the kingdom and its inhabitants, escaped the destruction of Atlantis in DC Comics' "Aquaman" (vol. 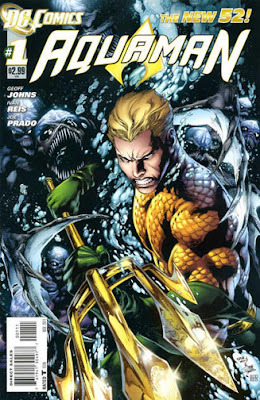 7) #1 (Nov. 2011) created by Geoff Johns. DC's "New 52" then rebooted the continuity, with Johns introducing the Trench' into a new timeline, making them antagonists. 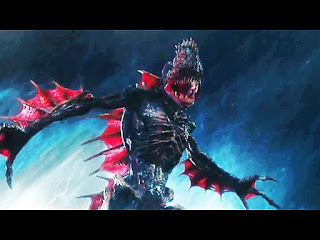 "...the 'Trench' had been inhabitants of 'Atlantis' before that continent was destroyed and submerged by 'Atlan', the 'Dead King'. 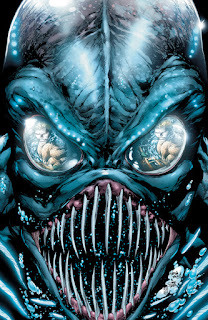 Only three major groups of old Atlantis survived that event, including 'Aquaman' and the 'Atlanteans', the 'Xebelians', in the 'Bermuda Triangle' and the 'Trench', who were thrown deep into the 'Marianas Trench, where they adapted their traits and powers..."
In director James Wan's "Aquaman", the 'Trench' are one of the known tribes of 'Atlantis' alongside the 'Atlanteans', the 'Xebel' tribe, the 'Fisherman' tribe, the 'Brine' tribe, the 'Deserted' tribe, and the 'Forgotten' tribe. 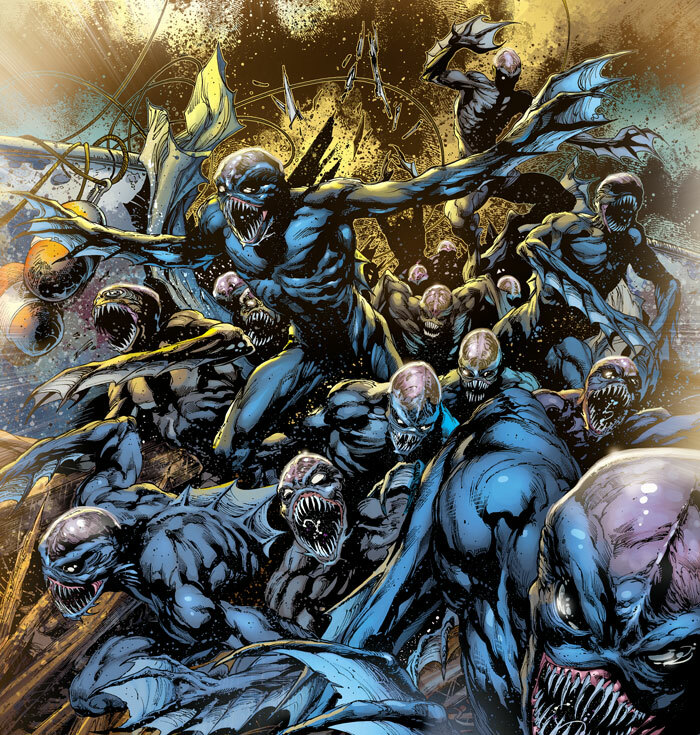 'Atlanna' is sacrificed to the Trench for having a half-human son. Then in their quest to find the lost 'Trident of Atlan', 'Aquaman' and 'Mera' are attacked by a legion of amphibious monsters identified as 'Trench'. They fend off the attack and reach a wormhole that transports them to the 'Hidden Sea' located at the center of the Earth. 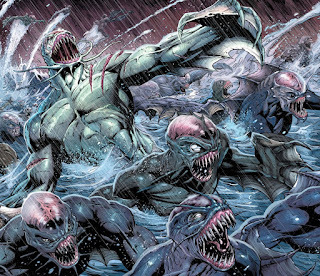 Later, Aquaman is seen commanding the Trench along with 'Karathen' and other marine animals in battle against 'Orm' and his followers.